Edgar Harney elementary’s new leader Ismail El-Shaakir welcomed students back earlier this month following the district’s takeover of the school. The federal distribution formula — which ties federal funding to school districts — doesn’t fully account for New Orleans’ decentralized system of schools. The Orleans Parish School Board acts as an authorizer for dozens of independent school districts — charter networks and stand-alone charter schools. That’s because in most other places, full school districts don’t close, especially not in the middle of a school year. But in New Orleans, they can. “I think there is more work to be done but this is new territory for the whole country so there aren’t great models to replicate and the [federal Department of Education] is not especially open to or ready for our kind of system,” said Adam Hawf, a former state Department of Education and Orleans Parish schools administrator. “It is a credit to the ingenuity and commitment of LDE and OPSB staff that there aren’t more glitches like this,” he said. Under New Orleans’ high-stakes accountability system, the parish school district can close those charter “districts” in the middle of a school year — after federal money has been dedicated to them but before they’ve used it — and assume control of the schools. But this is the first time OPSB has actually done it. The Orleans Parish school district has made adjustments in how money flows to schools in the soon-to-be all-charter city, but the state can’t divert federal dollars midyear from one school district — in this case, Harney’s former charter board — to another — the Orleans Parish school district. The state is closing out Harney’s charter operator, Spirit of Excellence Academy, as if a school district shut down. That includes an audit of federal funds at the end of what is likely a two month process. Then, that money returns to the state to be redistributed. The district is working with the state and was still hoping to utilize the money earlier this month. Chief Operating Officer Eric Seling presented it as a solution to the budget gap at an Orleans Parish School Board meeting mid-month. But assuming the money is unavailable, it’s unclear exactly how the district plans to fill its budget shortfall at Harney. The Orleans Parish School Board has already denied a request to subsidize Harney’s operations using its general fund budget. 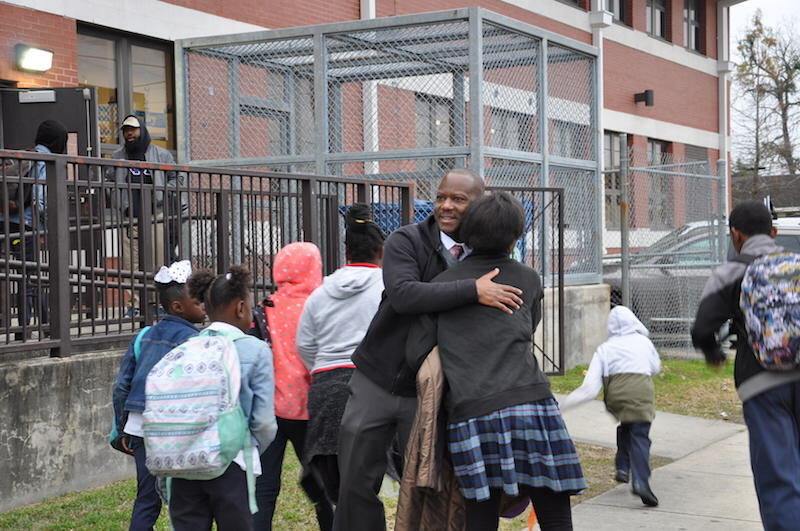 In December, the board voted against a $600,000 general fund allocation that Orleans Parish school district Superintendent Henderson Lewis wanted to run the school. District officials did not return multiple requests for comment. Last fall, following a year of official warnings for financial problems and other issues, Lewis asked Harney’s board to resign and surrender its charter. Shortly after, he announced he would seek to revoke the school’s charter. He told parents and staff the district would operate the school for the remainder of the school year. Eventually, the Spirit of Excellence board agreed to give up the charter contract for the school it opened in 2010. In order to run the Central City school and pay employees, who had to reapply for their jobs to become district employees, the district had to create a budget specifically for Harney. This month, the board approved a budget adjustment that allows the district to recognize and spend per-pupil state funding from Harney’s students. The money, a mix of Title I and other types of federal funding, isn’t allotted to local education agencies — or LEAs — the same way state per-pupil funding is. Title I money, for example, is assigned to LEAs based partly on their share of low-income students in the state, as counted in U.S. Census data. The money comes to the LEAs as reimbursements for allowable expenses, including supplies and teacher salaries. Any money that isn’t claimed goes back to the state for redistribution based on state formulas, a department official told The Lens. Now, the state is in the process of closing out the Spirit of Excellence’s LEA. That’s a 45-to-60-day process, according to a state official. An audit at the end determines how much, if any, federal money went unclaimed by the nonprofit. As of Monday, Spirit of Excellence had $333,303 in remaining federal reimbursements, according to the department’s grants management system. Spirit of Excellence could still request unused reimbursements for expenses that occurred while it ran the school. But money spent by OPSB following its takeover of the school, which happened earlier this month, won’t qualify for Spirit of Excellence reimbursements, a state official said. Crescent Leadership Academy, which also closed mid-year, left $136,350 in federal funding unclaimed, according to a state database. But the school’s students were sent to other schools in Orleans Parish. Harney is still set to close at the end of the school year. The Orleans Parish School Board is scheduled to meet the third week of February. Harney’s budget is likely to be on the agenda.